3M(TM) Adhesive Transfer Tape Extended Liner 466XL is a 2.0 mil, general purpose, extended liner, pressure sensitive acrylic adhesive transfer tape ATT with a densified kraft paper liner. Medium Firm Acrylic Adhesive 340 family. 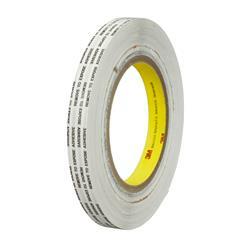 Jaco Aerospace and Industrial is your one stop resource for 3M(TM) Adhesive Transfer Tape Extended Liner 466XL is a 2.0 mil, general purpose, extended liner, pressure sensitive acrylic adhesive transfer tape ATT with a densified kraft paper liner. Medium Firm Acrylic Adhesive 340 family. and all of your 3M Products, Tapes, aerospace and industrial needs.